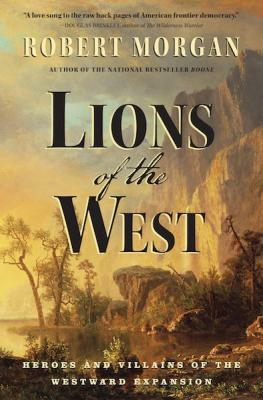 North Carolina born Robert Morgan, spent about 40 minutes of that evening reading from a simultaneously published book of poetry, stemming from his research for Lions of the West, but most of that time talking about the history of America’s westward growth. ..and was negotiated by Nicholas Trist, Jefferson’s grandson, by mariage. I found it interesting that a majority of people who came to hear the talk were at least as old as Brenda and I, most of them much older. This was a generation who grew up on westerns. But what became clear from this talk and much of the revisionist history that has emerged in recent years, is how little we know about this era that so defined a generation of youngsters. And this brings me to the second thing I found interesting about Morgan’s talk. It was a compelling story that he delivered powerfully, eloquently, and certainly unhampered by the charms of his southern roots. But it wasn’t until a conversation with Brenda, during our drive home, that it occurred to me why his talk was so compelling. Brenda said that she liked the way Morgan wasn’t trying to sell the book, and I realized that it was his perspective. The story that he spun in his talk was about what he’d learned during his research. But it was this angle that I think especially charmed me, that Morgan did not talk about what he knew. He spent a half hour talking about what he’d learned. ..and of course, this brings us around to one of my continuing themes, that learning, learning practices, the sharing of learning, and what you can building from your learning, are far more important today than even the very best practices of teaching. “Here’s what I’ve learned,” I think, is a golden key for unlocking the learner-impulse in others. I had the pleasure of facilitating an unconference session at Friday’s CUEBC conference in Port Coquilan, British Columbia. I had just finished my keynote, so it was a great way to follow-up. Admittedly, I did not start things off very well (my prompting question was too complex), but the session turned out to be productive — in my opinion. There were quite a few beginners, but mostly some well connected educators, for whom this was probably not their first unconference experience. This is not incorrect. We have to teach skills. We always have and we always will. But it seems to me that a large and explicit part of 21st century learning and the transformed classroom is the notion that skills must become habits. We need to teach our students important skills, but we need to also craft and cultivate learning environments and experiences where learners are constantly provoked to use those skills as part of their learning practice. We need to instill a learning lifestyle. We teach reading at an early age. Then our learners use those skills throughout the rest of their schooling. We need to more fully describe the expanding qualities of literacy that reflects today’s networked, digital and info-abundant environment, and then make sure that learners are utilizing all of these skills as part of their learning practices. I’ll say it again, We need to think about ”learning literacy”, not just literacy. During the day, I had a number of educators come up to me explaining that they were still in university, or a first year teachers, or experienced but considering technology in their classrooms for the first time. They wanted to know, Where to go to begin to learn how to transform their classrooms for 21st century learning? ((What do we call 21st century learning when we’re more than a tenth of the way into the century?)) That’s the question I should have prompted the unconference session with. Almost a month ago edtech administration guru Scott McLeod posted a request (How would you revise principal preparation?) for ideas about rethinking university graduate programs for school administrators. The comments continue to come in. At the point that I was directed to his post, there were already a number of thoughtful and comprehensive ideas, so I decided to add a few less conventional or down right outlandish ones. I later dumped my comment into 2¢ Worth as a draft, thinking it might, at some point, be of interest to you. 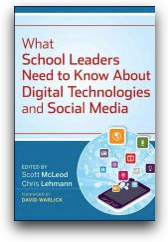 I arrived home yesterday, from the School Librarians’ Association of WNY conference, to my copy of What School Leaders Need to Know About Digital Technologies and Social Meda — by Scott McLeod & Chris Lehmann (editors). What a treasure trove, with articles by Kristin Hokanson, Christian Long, Stephanie Sandifer, Vicki Davis, Steve Dembo, Wesley Fryer, Will Richardson, Karl Fisch, Mathew Needleman, Michael Barbour, Richard Ferdig, Sheryl Nussbaum-Beach, Chris Lehmann, Pamela Livingston, Tom Hoffman, John Rice, Dean Shareski, Mary Beth Hertz, Carl Anderson, Richard Byrne, Scott Floyd, Miguel Guhlin, Joyce Valenza, Doug Johnson, Diana Laufenberg, Mark Wagner, Alec Couros, Kevin Jarret, Kimberly Cofino, David Jakes, Liz Kolb, Sharon Tonner, Ewan McIntosh, Jeff Utecht, and Afterward by Christopher Sessums. With that out, I thought I’d go ahead and post the suggestions that I added to McLeod’s conversation. Make them read and talk about some selected science fiction books. School leaders need to think and make decisions with the next 10, 20 and 50 years in mind. Some of the writings of Cory Doctorow and William Gibson come to mind. “The Singularity is Near” by Ray Kurtzweil might be a good one. I’m sure there are others. I would suggest that community-building and culture-crafting are two essential skills for school principals. 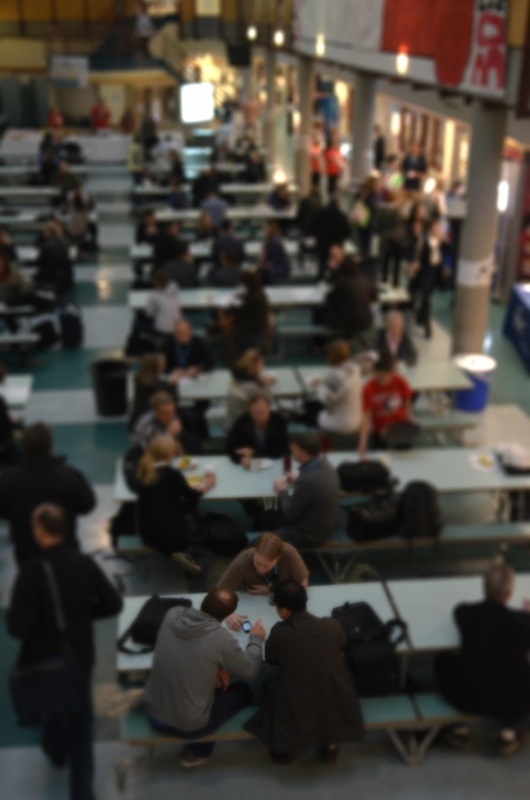 You might figure out a way to include some sort of field trip, possibly virtual, to schools that are exemplary in terms of community and culture and engage future principals in conversations about those schools, including in those conversations the schools’ practicing principals and vice-principals, teachers, and students. Future principal might be sent out with microphones and cameras (or iPads) to those schools to create multimedia tours that would be used by future classes. Require them to research and then design a new school library, retrofit an old building for digital learning, design a brand new school. They should be able to describe their ideal school, the characteristics of its staff and then create a list of questions to ask prospective employees during interviews that would identify new staff. Future principals involved in internships would be required to maintain a blog where they describe their experiences, learnings, and insights — understanding that their blogs may become part of the departments growing curriculum. Various blog entries would be selected and featured for current and future students’ considerations and conversations. Much of this would be supported by a learning network of practicing educators that is cultivated by the department’s faculty. Educators who are in the program would also, as part of the program, cultivate their own learning networks that could be described and evaluated, and that would support them in their university work and be carried with them into their careers as administrators. 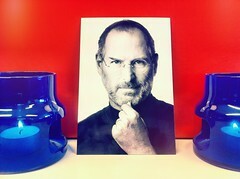 There is much that can be said about Steven Jobs. I would like to simply say that he was a man of great ideas and the skills to make them happen. During the creation of the original Macintosh, he told the designers that he wanted a computer that was as easy to operate as a telephone. It seems proper that last night I learned about the passing of Steve Jobs from a telephone that he turned into a computer.